On the Home or Tasks page, click Run or Manage Backups. In the Run or Manage Backups window, click Define New. If you have not yet defined a backup, the Easy Setup dialog appears instead. 3- Click Back up my computer, and then click Next. 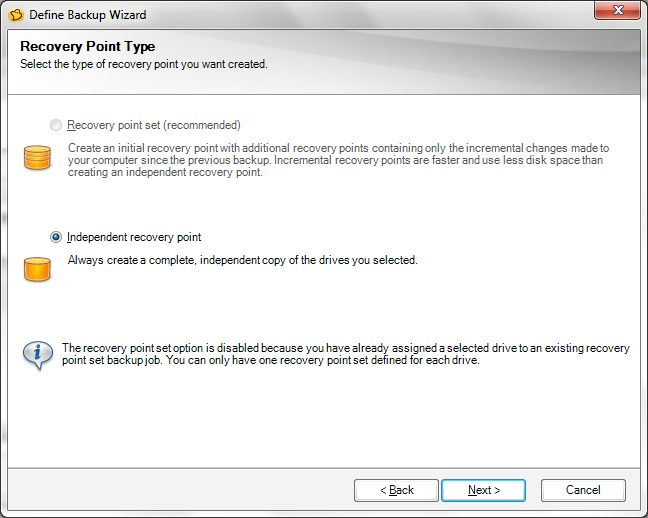 I have noticed that when I reached to the Recovery point type options that Recovery point set (recommended) is not activated to be chosen, but the Independent recovery point is automatically selected. If you have a look at my screenshot above, you will be seeing that recovery point set option is disabled because you have already assigned a selected drive to an existing recovery point set backup job. You can only have one recovery points set defined for each drive. I have really created recovery point set with Norton Ghost to the same destination which I have done now. However, I have restored my computer from the Factory Recovery. Then, the Norton Ghost removed. So, Recovery points I created before became unassigned to this drive(destination).